It is certainly the most familiar structure along the Monmouth Beach coast, and perhaps, along the entire Monmouth County shore. While many of the borough’s grand oceanfront cottages are gone, this classic edifice with its stately white pavilions still architecturally defines our town. May this landmark forever stand. Construction on this magnificent seashore facility, situated along Ocean Avenue at the foot of Beach Road, began in 1912 and was financed by a once-prosperous New York attorney, Thomas W. Butts. A Gilded Age developer, Butts had also built the nearby Monmouth Beach Casino (now our Borough Hall) on Beach Road in 1896. He would later fall into financial woes and lose the club to tax delinquency. Officially known as the Monmouth Beach Bath & Tennis Club (although it’s called “The Club”) today, the property is privately owned with a membership of 350+ families going back four generations. The 9.5-acre land (with beach) is assessed for over $5 million. New membership requires endurance — there’s a long waiting list. 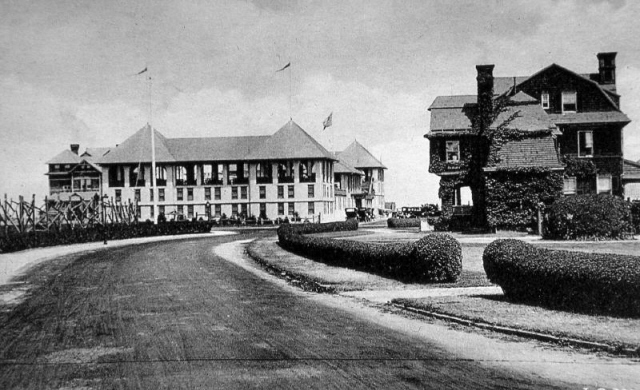 First named “The Baths,” the facility “came into existence when prosperity reigned and technology energized our vibrant nation.” The club offered a “summer haven with release from the rigors of the week’s labors and an opportunity to enjoy friends and family.” Some local historians say the structure is one of the few original beach clubs remaining along the entire Atlantic Coast. William Heitzman, the borough’s first mayor, was in charge of the club’s construction. The facility was completed in time for the 1914 Summer. A busy man, Mayor Heitzman also built five large cottages north of the club (all gone now) and also did repairs on the borough-owned bathing pavilion to the south. The club’s original design included a large open area building constructed around four large pavilions (the east towers were removed in 1948 due to structural concerns). Large Tucson columns surrounding an Olympic-size pool gave off the flavor of Roman baths. MB Club in the 1920s. For many of the early years, the swimming pool was salt water, which had to be drained and refilled every other day. In the early 1980s, the pool was converted to a chlorine filtration system. The club was closed during the World War I years, and afterward fell into disrepair and on hard economic times and was lost to the borough for unpaid taxes. 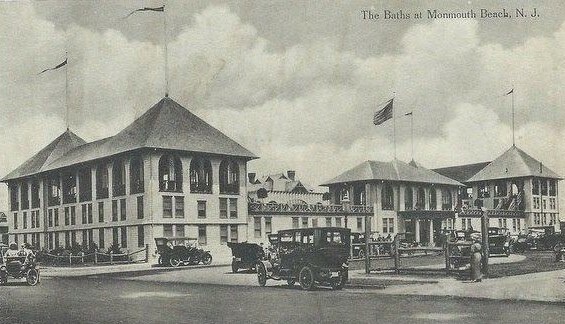 In July 1923, the borough approved an ordinance to buy the land and building that encompasses the Monmouth Beach Club for $55,000 from the Winfield family (who also once owned the MB Clubhouse Hotel up the road). The council also approved an additional $40,000 to acquire several old deteriorating homes to the north of the club. By the summer of 1927, the Monmouth Beach Club had seasonal revenues of $10,500. In those days, club membership included year-around and summer residents and those who owned or rented the many large seashore cottages along Ocean Avenue and around town. Summertime entertainment at the club was lavish. Dances in formal attire accompanied by large string bands were common. Croquet was played on the large lawns and annual bridge tournaments were held in the ballroom of the east towers. The club’s first official president was James W. Spalding (of sporting good fame), who served from 1924 to 1928. By January 1929, the borough had assumed nearly $130,000 in debt to make improvements to the club (damage from frequent big storms was costly). Lamenting the specter of growing financial liability to manage the club, the borough council wondered in 1931 “what to do with it.” At that time, the borough’s total annual municipal budget was barely $100,000. That same year, the borough council sought a $15,000 annual fee to rent out the club for a season. They got and accepted a bid of $8,000 for a two-year lease from the Monmouth Beach Association led by Judge Alfred J. Talley (a former Clarence Darrow colleague) and club president David Jarvis, who explained that their group was “trying to build the borough into a high class resort.” Then Mayor A.O. Johnson, who owned a local realty business, brokered the deal. The first tennis courts were added in 1930. By 1934, thanks to Depression times and the borough’s own poor financial condition, the annual lease fee had fallen to $5,000. 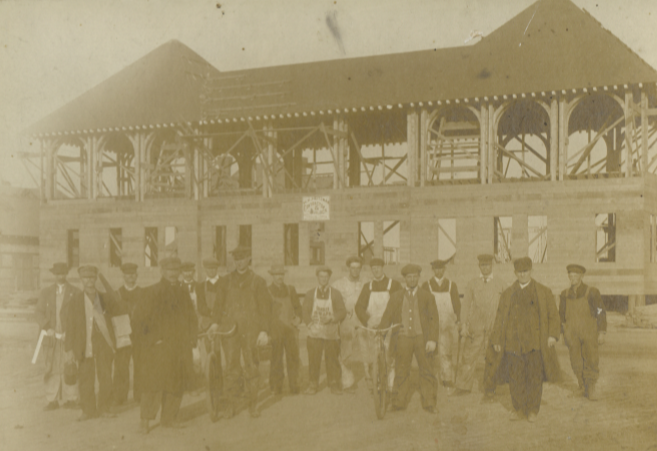 MB Club under construction, c. 1912-13. The club was also known for its many luminary visitors through the years. In the summer of 1928, Al Smith visited during his US presidential bid that year. It didn’t help. Smith, then governor of New York, was soundly defeated by Republication Herbert Hoover in that election. Jimmy Walker, New York City’s “fun-loving” Democratic mayor from 1926 to 1932, was a also club visitor. Members of the New York Yankees also enjoyed the club. The famous Bronx Bombers found Monmouth Beach through the family of Bobby Brown, a third baseman and later physician, who lived on River Avenue. Those late 1940s Yankee visitors, on their way to five straight World Series titles, also included Hall-of-Famers Mickey Mantle, Yogi Berra, and Whitey Ford, who rented an apartment on Wesley Street. In the spring of 1937, borough commissioners approved the construction of clay tennis courts; today there are eight on the property. Bill Tilden, the world’s best tennis player in the 1920s, was an occasional guest. Jim Maguire, a former club president and friend and business colleague of billionaire investor Warren Buffett, won the club tennis championship at age 15 in 1945, a war year. Like all beach clubs, time and tide have worked against the facility. Although a protective jetty to the north was first built in 1921, the club sustained serious damage after major storms in 1927, 1932, 1938, 1953, 1962, 1992 and 2012. To accommodate growing membership, the west tower was converted to bathhouses. In 1938, six cabanas were added along the club’s north boardwalk. Still more were added in 1966 and 1981 and today there are over 40 bathhouses along the club’s oceanfront. In 1981, the club was granted a liquor license. 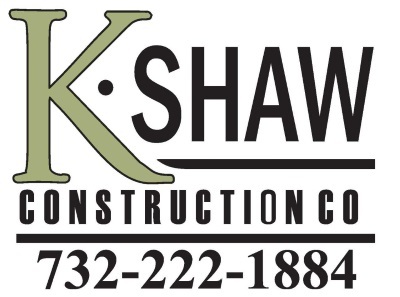 During the 1960s, Al Showler operated a real estate and insurance office in the southwest section of the building. In the 1970s, Saks Fifth Avenue of New York used the club surroundings to shoot a high-end women’s summer wear catalogue. Club managers through the years include Jim McConville (a former borough mayor and the club’s longest serving manager from 1989 to 2014), Fred Messina (manager from 1966 to 1987), Peter Sheridan (former borough councilman and founder of Pete’s Inn), Morgan Woolley, Fred Horner, Bill Egan, and Stuart Van Ness. In 2007, the membership completed work on a large $3 million renovation project. The entire facility received major structural upgrades, new siding and roofing, and the south pavilion was refurbished. The club also had to make major repairs after Hurricane Sandy in October 2012 — including wreckage of all the oceanfront cabanas north of the main building.